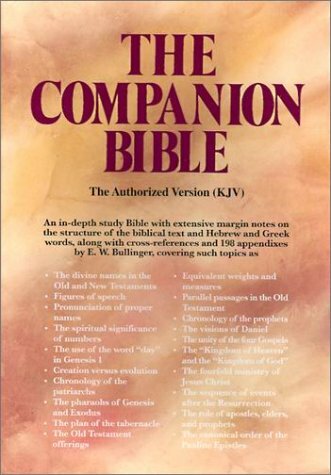 Levend Water has put ALL the 198 Appendixes of The Companion Bible on the site. The Appendixes were written by Dr. E.W. Bullinger. For your convenience we have linked the Appendixes together as Bullinger has done in The Companion Bible. We hope you enjoy the Appendixes. The Companion Bible (KJV) is the absolute BEST Study Bible that I know of. Each Book of the Bible is introduced, outlined and it's structure is shown. Every page of the text has a parallel column jammed packed with explanatory notes. Many of the Old Testament notes are based upon Ginzberg's Massorah (small writings in the margins of the Hebrew texts). E. W. Bullinger, the Editor of The Companion Bible, was the only Christian Ginzberg allowed to help him with his collection of the Masoretic Notes or even to see them. This is the ONLY place I know where an English reader has access to this extremely enlightening material. The New Testament marginal notes are a great help to any Bible student, as well! Not to mention the virtual treasure trove of Bible knowledge available in the 198 appendices in the back of the book. All these appendixes are listed below. The Synonymous Words used for "Man"
The Synonymous Words used for "Wine"
The Synonymous Words for "Sin", "Trespass", "Iniquity", &c.
"The Book of the Law"
The Use of Various Types in the English Bible: A.V. and R.V. Psalm 15, and "The Sermon on the Mount"
"The Sufferings, and the Glory"
The Usage of Pneuma in the N.T. The Synonymous Words for "Will" and "Wish"
The First Fulfilment of Prophecy in the N.T. The Usage of Negatives in the N.T. The Synonymous Words for "Appear", "Appearing", &c.
The Principle underlying the Quotations from the O.T. The Synonymous Words for "Child", "Children", &c.
The Use of Psuche in the N.T. The Synonymous Words for "Repent", "Repentance", &c.
The Synonymous Expressions for "Kingdom"
The "Kingdom" and the "Church"
The "Kingdom of Heaven" and the "Kingdom of God"
The Synonymous Words for "Preach"
The Synonymous Words for "Judge". "Condemn". &c.
The Synonymous Words for "Man"
The Synonymous Words for "Other" and "Another"
The Synonymous Words for "Perfect"
The Synonymous Words for "Poor"
The Synonymous Words for "Sin", "Wickedness", "Evil", &c.
The Synonymous Words for "World", "Earth", &c.
The Synonymous Words for "Light"
The Synonymous Words for "Hell"
The Synonymous Words for "Know", "Knowledge", &c.
The Synonymous Words for "See", "Look", "Behold", &c.
The Synonymous Words for "Pray" and "Prayer"
The Synonymous Words for "Love"
The Synonymous Words for "Wash"
The Synonymous Words for "Worship"
"The Gospel of the Kingdom" and Other "Gospels"
"The Foundation of the World"
"Everlasting", "Eternal", "For ever", &c.
The Synonymous Words for "Life"
The Synonymous Words for "Sleep"
The Synonymous Words for "Power", &c.
The Synonymous Words for "Send", "Sent", &c.
The Synonymous Words for "True"
The Synonymous Words for "Judgment"
The Synonymous Words for "Raise", "Resurrection", &c.
- I. Parallel Datings of the Times of our Lord. - II. Dates of "The Begetting" and the Nativity, &c.
- III. "The Course of Abia"
The Synonymous Words for "Grace", &c.
The Synonymous Words for "Servant", "Serve", &c.
Dr. E.W. Bullinger was born on December 15 in Canterbury, England. He was a direct descendent of the great Swiss Reformer Johann Heinrich Bullinger, a covenant theologian, who succeeded Zwingli in Zurich in December of 1531. Bullinger was educated at King's College, London. He was a recognized scholar in the field of biblical languages. The Archbishop of Canterbury granted him an honorary Doctor of Divinity degree in 1881 in recognition of his biblical scholarship. Dr. Bullinger died on June 6, 1913, in London, England, leaving behind a wonderful legacy of works to help us in the study of God's Word. The best known is "The Companion Bible". Bullinger began to work on the Companion Bible in 1908. When he died in 1913, he was ready with the Old Testament and the Gospels. Others have finished "The Companion Bible" after his dead..